Golf Packages, golf vacations and tee times only. Florida golf packages, Orlando Golf packages, Tampa golf, naples golf, scottsdale golf. We provide concierge style service with no service or transaction fee. Save time and money, 24 years of experience, golf experts standing by with unbiased advice. Over 400 golf courses and 250 lodging options to choose from. Custom golf packages, instant golf packages, local expertise. 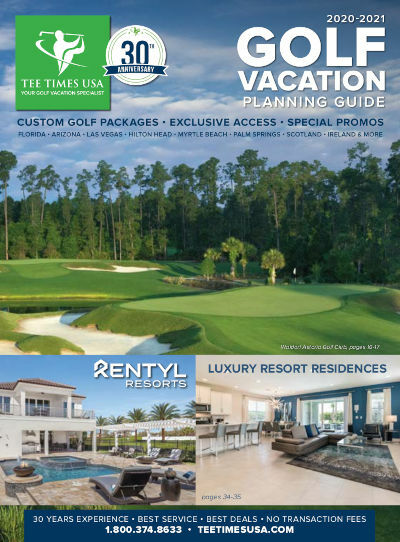 Call 800-374-8633 to speak to a golf travel reservationist who can design your ultimate Florida golf vacation package. Ah, Florida, as it stretches out into the warm Atlantic waters, it seems to have a gravitational pull on vacationers from all corners of the world . . . especially golfers. Cool ocean breezes await you, up and down both coasts, from Jacksonville to Miami and Tampa to Naples, we know where to find the best golf courses you’ll ever play. Travel more inland (although you’re never more than a couple hours from either coast) and metro-Orlando offers miles and miles of golf courses encompassing all styles and levels of play. Looking for forgiving fairways? PGA Tour course conditions? Undulation and rolling greens? (Yes, we know the state is almost completely flat, but we know where to find these gems). You name what you want and we can find that course to a tee (no pun intended). Actually, we know Florida so well, we can almost dream your golf vacation for you. We can put together golf packages starting out with warm-up courses to help loosen your swing and then produce a line-up that gets a little more challenging each day or keep things nice and mellow with the focus on just having a fun day on the course with your friends. Sample a different area over several separate golf vacations or hop from region to region, experiencing the best the “Sunshine State” has to offer in one trip. And when you’re done with that, you can go back and revisit your favorite courses, again and again, over a lifetime. We’ve got this all figured out, just visit the Florida section of our website and let your imagination be your guide. Or let us have some of the fun, pick up the phone and give us a call, one of our Florida golf vacation specialists (after all, we live here and actually play these courses) will help you plan a trip you will never forget.